Grandad made another birthday. 95 of them now. He's still looking pretty fit and well, all things considered. Pretty spry for an old guy (no apologies to Offspring there). 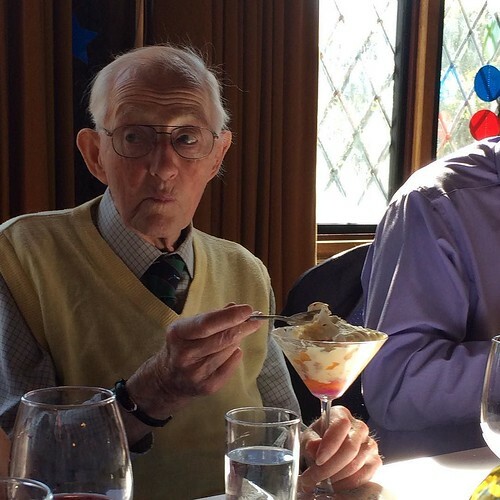 He certainly polished off that trifle quickly enough! Which disappointed my Dad, who'd been looking forward to finishing it for him. It's just over 6 years since Grandma died. He built a routine around caring for her and playing golf over the last eight years of her life, and he just seems to have carried on. More power to him! I have this photo on the wall in my study. 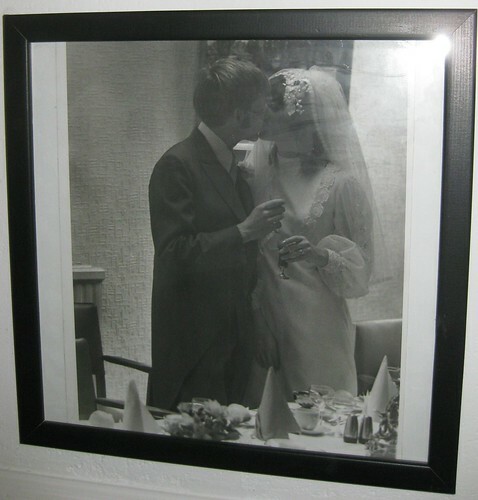 A photo taken 40 years and a couple of weeks ago, of my parents. Please excuse the grubby glass, it's been on my wall for a while now. Turns out I should clean it, huh? Dad was an undergraduate at Queens' College when they met. Mum was at Homerton. Dad is 6 months older than Mum, and 2" taller. In the top photo Mum was still just 21, while Dad had reached the heady heights of 22. They'd both just started jobs in London and had to be back at work on the Monday. A couple of weeks ago, 40 years later to the day, they treated a select band of friends and relatives to lunch in Queens'. Clarkie took photos, I caught up with people (like my godmother) who I haven't seen for years. That's a partial group, in the garden at home. A posh meal, with my brother in the distance at the head of the table. That would leave me at the foot. He gave a speech and everything. The latest challenge for my parents is going to be coping with both of them being retired. I'm sure they'll work it out. They have 40 years of practice now, that has to count for something. Well, that was an unintended hiatus. Life has been happening at such a rate of knots around here that when I've stood still long enough to blog I've needed to just collapse! I shall try to fill in some of the highlights. We went to Berlin at the end of March, for Clarkie's birthday and because we'd not been before. It was chilly, but sunny, and we walked everywhere. It felt like we covered a lot of miles, which was mostly because we did. I found it really interesting, but didn't fall in love with it. 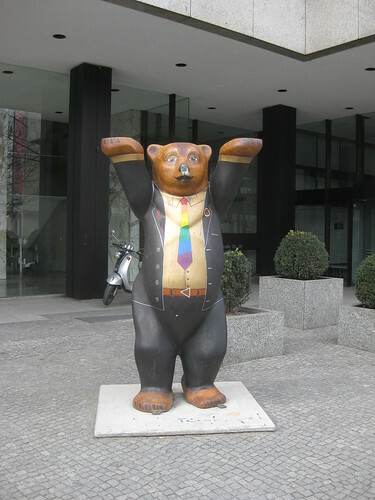 We did manage to get to a lovely free viola and piano recital at the Berlin Philharmoniker, and I took lots of photos of bears. We managed to join my Grandad for his post-birthday golf session in early April. My Grandad is now 91, and still regularly plays at Haywards Heath golf club. By regularly, I mean twice a week for preference, either 9 or 18 holes, walking the whole way. He does now use a motor on his buggy at least. We joined him for a family match, with my Dad and Uncle playing against him, and my Aunt, Clarkie and me caddying. Given the weather we'd had up until then, we had a beautiful day for it even if underfoot was a little boggy. By any way that they tried to add it up, Grandad won. At the end of April I was off on my travels again. Paris this time. If only I'd made it to London at some point. This was for a conference. CHI is THE big conference in my research area. I only had a workshop paper in, but it's still the first time I've had to stand up in front of a group of researchers (outside of my lab group) and present, so that was quite important. Fortunately it went pretty well (I think!). 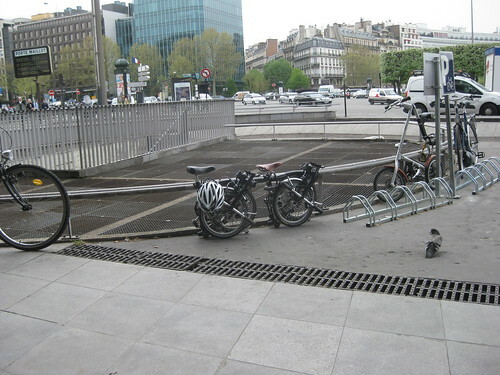 I was staying about 3 miles from the conference near La Defense, and with our previous happy experience of cycling around Paris I decided to take my Brompton rather than figure out public transport. I'm really glad I did, it's such a good little urban bike. And I wasn't the only one who had that idea - the other one (with the white helmet attached) had a "Drakes of Cambridge" sticker. After Paris, Clarkie picked me up from Ashford and we went straight up to Cambridge for a long weekend with my parents, and my other Uncle and Aunt visited from Australia with my Grandad. I don't seem to have taken any pictures, but it was a fabulous weekend with lots of amazing food (Mum may have been slightly incapacitated after a minor op on her legs, but she still catered magnificently), wine, and great company. On the Sunday I had a lovely run with Denise (who is my aunt by marriage, and only 10 years older than me so she doesn't really like me calling her aunty!). I was thrilled to find that I could keep up and maintain a conversation. To be fair, she's coming back from a serious achilles injury, but still! Since then, work on the project has been at a real peak. I'm just surfacing from that now, so hopefully (PhD-willing) I'll have slightly more time/energy to blog for a bit. I don't have any more international travel planned until August at least!